Description of "Long Live Inquilab! 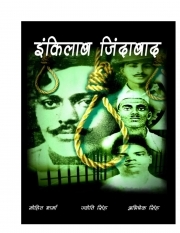 (eBook)"
Book covers Jallianwala Bagh Massacre & activities of revolutionary Hindustan Socialist Republican Association with artworks, poetry and scenes. This is first book published by ICUFC Comics in collaboration with Freelance Talents. Mohit Sharma Trendster / Trendy Baba, is a freelance Writer/Poet, Photographer, research student, social activist (Education, Poverty, Child Labour, Men's Rights & Fight Against Negative Generalization...stereotypes). Related Keywords - Trendster, Sameer, Trendy Baba, Sharma ji, Zehen, Raka, Mohitness, Freelance Talents, Mohit Trendster. Reviews of "Long Live Inquilab! (eBook)"